Although nobody knows for sure, i suspect this may have been one of the spiders mentioned on this thread. Slowly improving, but it's looking like a dry Xmas for me! Be careful out there - Andalucia's a dangerous place!! P.S. no comments about my legs please - they're obviously not shown at their best here!! My goodness that looks awful . Poor you and also we are all seven years older since this thread started At least that shows that not many people get bitten by spiders. I presume you could get some kind of awful flesh bacterial disease with that. Hope you are better soon. Out of interest are you in the campo or on the coast. Just so I know if I have to shake the bed a bit tonight! "P.S. no comments about my legs please - they're obviously not shown at their best here!!" The socks are nice though. I have a few pairs like that. The bite, if that's what it was, must have occurred in deepest darkest Torremolinos, because I hadn't been anywhere else when I first noticed it. "The horror, the horror!" I never felt anything. Unless it crawled up my leg when I went into the garden (to feed the feral cats, one of which accidentally bit me a month ago, leading to a tetanus jab and antibiotics, which I'd barely finished when I started the next lot), it could only have been lurking in my jeans (or socks!) when i put them on. Well remind me not to buy carrefour´s socks! Is it near to where you got bitten by the cat. You can get very bad infections from the bite of a cat! The cat bite was on my hand, but healed fine, no infection. They're very clean cats! I am sure the cats are very clean, but you can get very bad infections from your own domestic cat. It is because there is bacteria on their teeth which can cause bad infection. Lovely though that you are feeding the strays and hopefully castrating and neutering! Well that bite or infections looks awful but hopefully you will recover. It must have been something that creeps about in the night! The reason cat bites can be more dangerous than dog bites is that they have long very sharp "fangs" which go deep into the flesh. Bites in the hand are particularly dangerous as the infection gets into the bones and tendons very easily. If untreated, people have died from such bites. This is what is says from the Mayo clinic "Although cats have no more germs in their mouths than dogs or people, researchers at the Mayo Clinic found that when cats bite, their sharp teeth can inject hard-to-treat bacteria deeply into the skin and joints, increasing the risk for serious infection. "Dogs' teeth are blunter, so they don't tend to penetrate as deeply and they tend to leave a larger wound after they bite," study senior author Dr. Brian Carlsen, a Mayo Clinic plastic surgeon and orthopedic hand surgeon, said in a clinic news release. "Cats' teeth are sharp and can penetrate very deeply. They can seed bacteria in the joint and tendon sheaths." Well, I guess you can get an infection from any kind of bite if it's deep enough. I know a few people around here who I wouldn't want to get bitten by! Our (house) cat bites me all the time, playing rough, but she knows that if she even gets close to breaking skin, she gets a bop on the nose. The "garden" cats (all three of which we have had sterilised, so are less likely to come into contact with other ferals and pick up infections themselves) know me well and are normally very affectionate. The bite was not aggressive, it was out of fear: I picked up one by the scruff when rescuing her from being trapped in a neighbouring building's garage for over a week, and she just lashed out with claws and teeth in panic - but nothing serious. I took the precaution anyway of a tetanus booster & antibiotics. Well I am glad it is improving. I normally do not kill spiders, but it were a black widow I might. I shall have to start checking the house! Well done for sterilizing and feeding the stray puss cats. 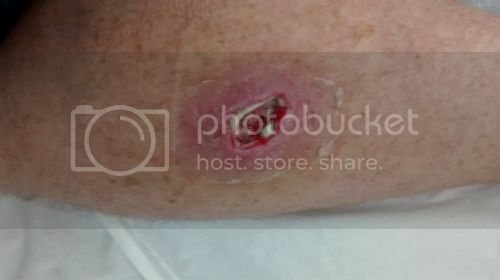 A quick Google of spider bites v MRSA reveals that it's such a common mis-diagnosis, that I'm more than a little pi**ed off that this wasn't picked up in Spain. MRSA is so widespread now, too, that I'm really surprised nobody thought of it before. The strange thing is, that NHS "protocol" is to do nothing. However, I kicked off after hearing the result of this swab, and I've now been prescribed antibacterial nasal cream & body wash - apparently, MRSA lives in the nose and on the skin. 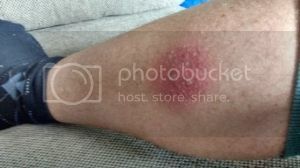 It's is contagious, but fortunately not through the internet, so you should all be safe despite knowing me here - but I thought I should update this thread in case somebody else gets an infected "spider bite" and and is prescribed antibiotics that won't help. This is what I'm hoping to find out. I'm booked in to see a dermatologist next week. Not sure if that's going to get us any nearer to an answer. Whatever it is, it's not making me "ill" as such, so I'm grateful for that, but I really would like to know what's causing these strange infections. Miro - can I suggest that since this is such a long and complicated set of circumstances, that you type out a history that you can present to the Dermatologist - as it will be so difficult to recount it all, chronologically, with attention to detail, and remembering what happened when and with what treatments and results, etc etc. So much more precise if you can write it out at your leisure, with time to correct and add, before you turn up at the hospital faced with a new person, new clinic, new situation. Even if your GP has sent a note to the Dermatologist explaining the case, I am sure he/she wont have given a full description. Unfortunately I don't have a list of the exact antibiotics that I took in Spain - I only know that they all ended in -cillin!